Features the OPTIMAX™ JNR economical, cordless, blue light LED leak detection flashlight. Versatile, multi-dose dye cartridges. 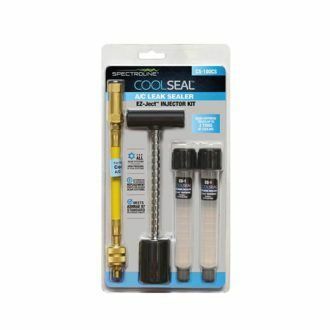 Injector easily overcomes system pressure.The revolutionary way to add fluorescent dyes into air conditioning and refrigeration systems — without the use of additional refrigerant, manifold and additional hoses. 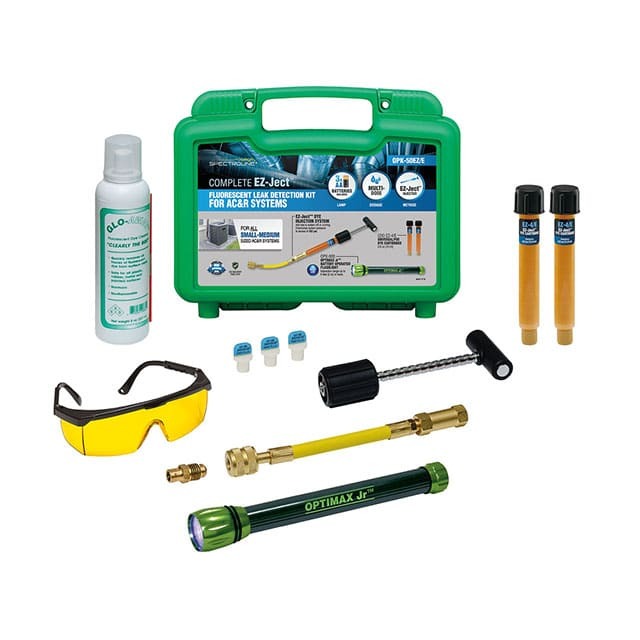 Spectrolines fluorescent leak detection system uses OEM-approved universal POE (polyolester) solvent-free dyes that reveal leaks as small as 5 grams (1/8 oz) per year or less. 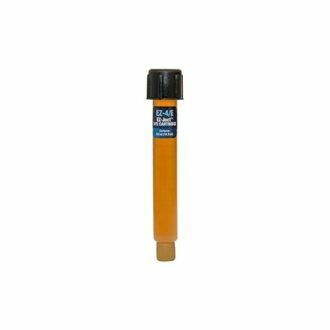 Compatible with CFCs, HCFCs, and HFCs and an inspection range up to 25 ft. Kit has an injector that easily overcomes systems pressure and allows you to add fluorescent dye even if system is up and running. Can treat up to 50 lb. of refrigerant, 4 gal. of lubricant, or 24 tons of cooling. Add fluorescent dye with system off or running! No pouring and no refrigerant required for injection. One calibrated cartridge provides exact dosing for multiple systems. Inject dye with a turn of the handle. Install the cartridge, then connect the injector hose to the system’s low-side service port. Turn the handle to inject the exact amount of dye required and let it circulate. Scan the system with a Spectroline® inspection torch. The precise location of all leaks will be shown by a bright, yellow-green glow.